When approaching Shimizu Port, it is easy to find out the white lighthouse at the port entrance. But, the red lighthouse on your right is blended into the background. There are many big commercial ships coming and going in the port. You will need binoculars to see if a ship comes to you or goes away. And, when a ship has the anchor down from the bow, it is stopping. Passing by the red and white lighthouses, head to a Ferris wheel at 35 00.65N 138 29.69E. As the space inside the port is too wide, it is difficult to know where you are. Move into the port passing by a black breakwater on your left and the Ferris wheel on your right. Pay attention to big cargos and big ferries moving slowly. The shipping lane is right-hand traffic though, you may move along the left side edge. Fujisan Hagoromo Marina is at the innermost of the port. I moored at an open berth on a marina holiday. The marina is closed on Wednesdays and Thursdays. The marina, which has rental bikes, is located at a convenient place. A big shopping center, a supermarket and a big DIY shop which has enough materials and electric tools for your boat maintenance are nearby. Prices are low. In addition, as there are many restaurants nearby, you can live here. The mooring fee is JPY 4,200 per night for a boat shorter than 12m. The pontoon is equipped with free water and JPY500/day electricity. Coffee is served at the marina house. Shower is clean and available for 24 hours. If you like a bath, take a bus or ride a bike for 10 minutes to a hotel which has visitors bathtub service for JPY 500. Coin laundry is 10 minutes walk away. 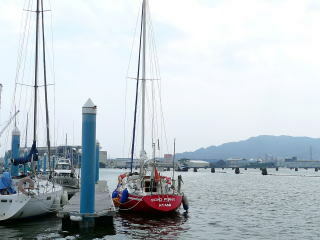 This is a safe marina located in the innermost of the bay protected with multi layered breakwaters to typhoons. I should say this is a good marina. But, on the flip side, the water is not so clean because it is at the innermost of the bay. I couldn’t see the below and didn’t want to dive into the water. 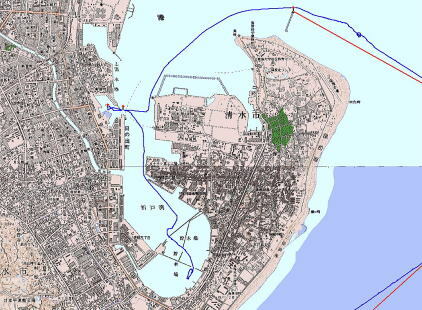 The original small Shimizu Port is around the Ferris wheel at the west side of the greater Shimizu Port.